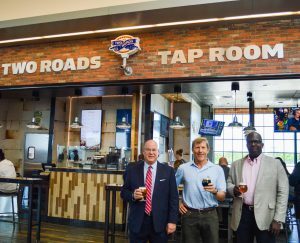 JUNE 22, 2017 – Two Roads Brewing Company and the Connecticut Airport Authority are pleased to announce the opening of Two Roads Tap Room at Bradley International Airport. The Tap Room, which is located post-TSA screening, was opened in conjunction with The Michell Group, Bradley’s restaurant operator, and is modeled after the brewery’s tasting room in Stratford, CT. The Two Roads Tap Room is located post-TSA screening in the Gates 1-12 concourse and is open daily. It will serve a number of Two Roads beers on draft, beer flights, and food options such as thick cut deli sandwiches and breakfast sandwiches. Beers from several other Connecticut breweries will be served as well.